Players must make more than one effort when the ball is in their area, however some players have a tendancy to be lazy and stop after one effort. This drill makes players recover quickly, simulating the sustained intensity required in a game situation, plus they practice goakicking when tired from their effort. 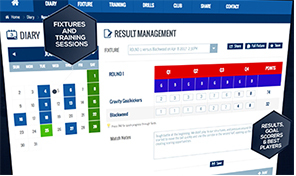 afl training for players, free afl coaching drills, aussie rules kicking drills for afl training for players using these skills: reflex handball, goalkicking, tackle, ruck. This drill practices a switch movement while at the other end a link player executes a series of handballs to work across the ground into open space. 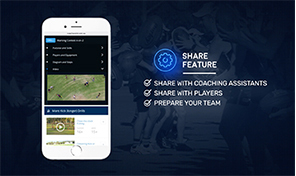 australian rules kicking drills for afl training for players with a focus on defensive, run & carry, game plan , free kicking drills for afl training for players, afl coach. When a player is being tackled, it's vital they don't let their opponent pin their arms and can give a handball to advantage rather than let the ball spill out loosely. This drill teaches players to position their body when being tackled so they can get an effective handball away rather than turnover the ball. 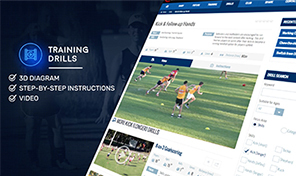 afl training for players, afl pre season training program, aussie rules handball drills for afl training for players using these skills: tackle. A warm-up drill that focuses on accurate delivery of kicks, plus the timing of a front & square runner who releases a link player out wide. australian rules handball drills for afl training for players with a focus on front & square , free handball drills for afl training for players, afl training session. This drill practices kicking long to a leading target, and providing a running option for a marking player. 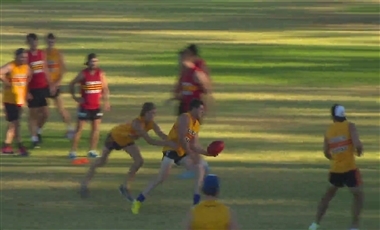 afl training for players, pre season training drills, aussie rules rucking drills for afl training for players using these skills: long kick, shepherd. Players need to increase their fitness and workrate to make it the next contest without dropping off. This drill has 2 players gut running to become a front and square handball option multiple times in succession. australian rules rucking drills for afl training for players with a focus on front & square, hard running , free rucking drills for afl training for players, football drills and skills.